We have already talked about Pima Cotton in an old post… Do you remember? Not all types of cotton are equal. Like for coffee, or fine wines there are also different types of cotton that can have significant differences in quality. Pima Cotton is considered the “cotton of the gods”: the ancient Peruvians believed that cotton flakes were nothing but fragments of cloud fallen to earth to clothe the Incas people, a kind of gift from their gods! As an image it is already quite poetic, but it is not enough. Imagine now a blue sky, a gentle wind among the reeds, the waves breaking … and some brushstrokes of color. You will be immediately transported in a real impressionist painting! 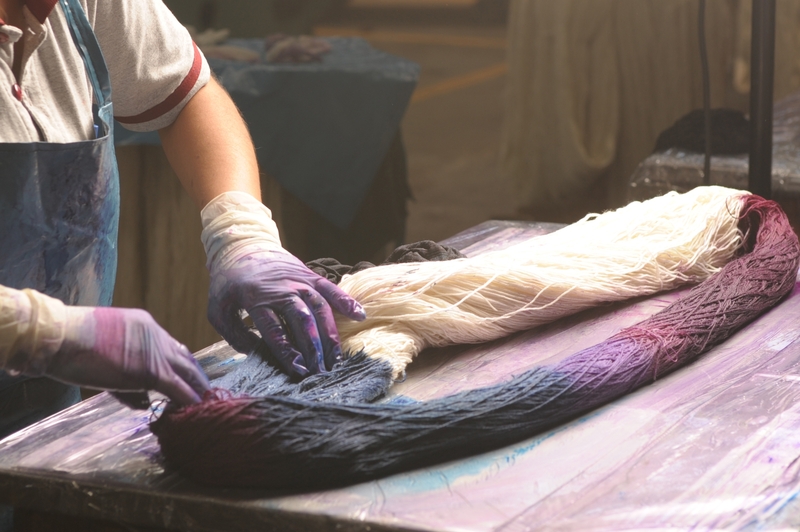 This is how Pima Cotton Hand Painted is born, yes, excatly dyed by hand! What does it mean Hand Painted? For dyeing yarn, there are various techniques. Often in industrial production, first the fiber is dyed and then it is spun. Hand Painted is a particular dyeing technique with a low environmental impact, done manually, brushing various colors, one over the other, so that color overlaps and completely unexpected shades are created. Due to this manual dyeing process, the product is unique. The combinations currently proposed are 3. From the tones of the sky, to the nuances of the earth to the beautiful rosy tones of dawn. They are real brushstrokes of color, plays of lights and shadows, as in an impressionist painting, which will show you unusual color combinations! What are Pima Cotton Hand Painted characteristics? Pima Cotton Hand Painted has the same characteristics of traditional Pima Cotton. It is the finest cotton in the world and is renowned for its extraordinary softness, a delicate lustre, resistance to wear and pilling. Pima Cotton‘s secret is its origin and harvesting. It grows strong and happy on the northern coast of Peru until skilled hands do not collect it. The secret is all here. With these features it makes it easy and pleasant to work with! 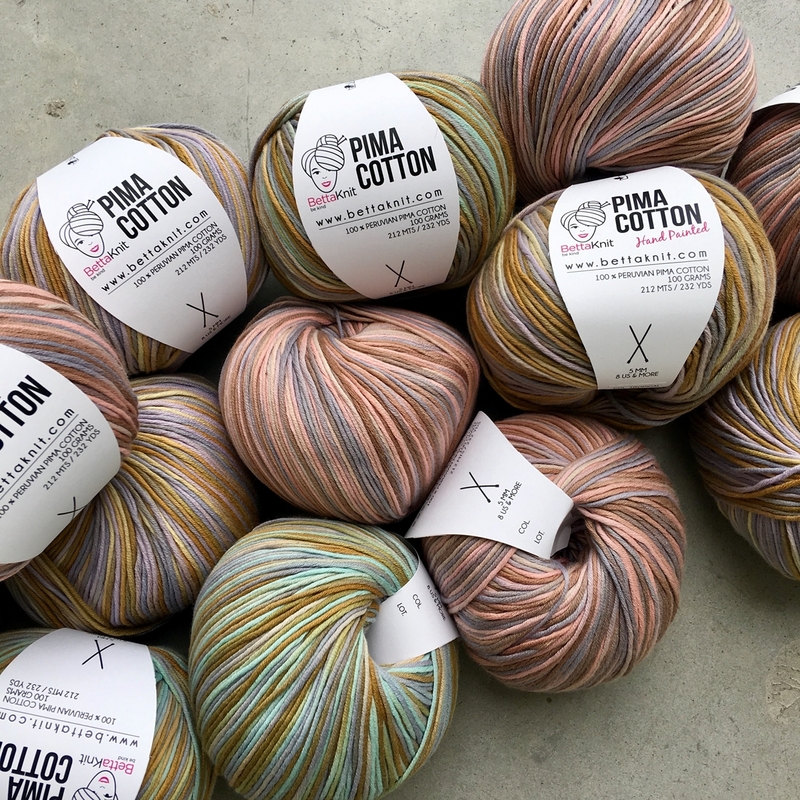 Pima Cotton Hand Painted is packaged in 100 gr balls of yarn and it is 212 m/232 yd long. We recommend to knit it with 4 mm (6 US) or 5 mmm (8 US) knitting needles. In this case you’ll get a tension of 2 stitches into 1 cm/0.35 “. 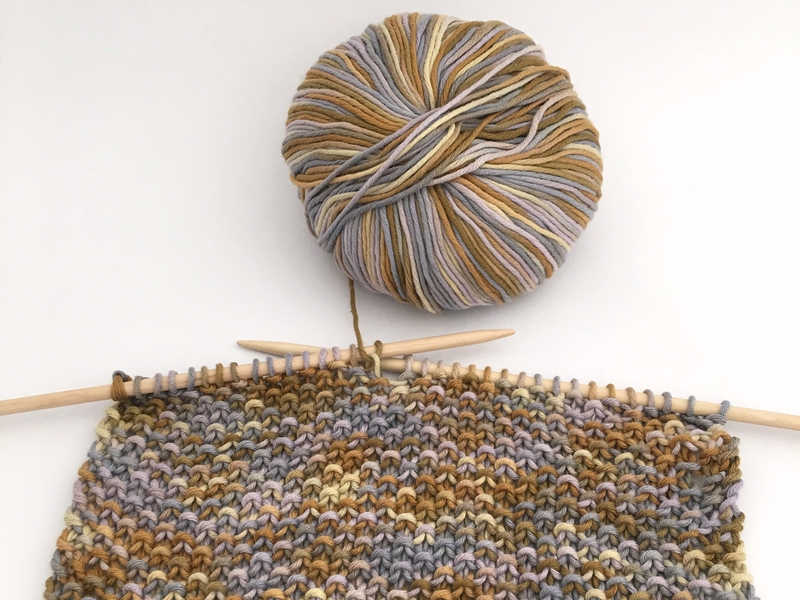 If you want to knit it with two strands of yarn, the best result is with 8 mm (11 US) knitting needles (ou can find them here!). It is perfect for crochet as well! What can I kit or crochet with Pima Cotton Hand Painted? Pima Cotton Hand Painted has the same features of traditional Pima Cotton, but your knitting and crocheting projects will be characterized by a unique and… faded touch! Depending on whether it is knitted or crocheted, the chosen stitch (stocking stitch, garter stitch, moss stitch, openwork stitches), you can get different color effects! In fact, the color strokes are not uniform in the balls, and the different stitches will highlight some color traits rather than others! How to wash Pima Cotton Hand Painted? Pima Cotton is a fine yarn. The Hand Painted version is even much finer. Therefore, if you want your products last, you must be careful in washing. But do not panic! The color fastness is the same as Pima Cotton “plain color”!! • Lay flat away from direct sunlight. By following these steps you will be sure to that your item will be as good as just knitted! A fantastic idea popped into your head? Soon some new lits will be online! As always, if you want to ask us some questions about this yarn or other products, we will be very happy to answer you! Contact us on our social (Facebook, Instagram); through chat site or writing an email to betta@bettaknit.com.